Imagine the feeling of landing on a foreign planet and surviving the descent with no damage to you or the equipment you had on your person. There is literally nothing around you that makes sense — the colors of the landscape are different, the noises that you hear don’t resemble anything that you can call to mind — and yet, it feels familiar. The familiarity guides you; it encourages you to progress in the way that you would if you were in a similar situation in a more familiar environment. But, here, it can only nudge you… because everything is still different. 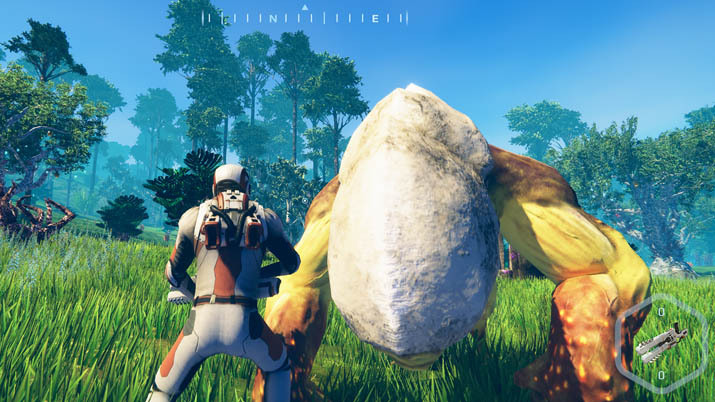 Planet Nomads is a Unity game that has recently been published by the studio Craneballs, more known for their mobile games, historically, than full-scope PC games. 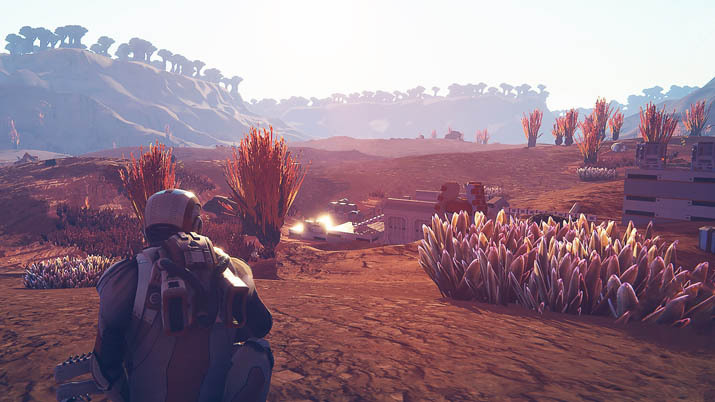 It’s best described as an open-world survival sandbox set in space, though a good chunk of the game seems to revolve around base-building and exploring planets after stepping out of the initial stasis pod in which you arrive. So far, it’s mostly landing on planets and dying. The experience described at the beginning of this article is the closest description of what Planet Nomads has been for me thus far. My immediate inclination when I exited the pod that crash-landed on “Planet X” (named as such because you could name your own planets, and it sounded mysterious at 10 PM, with a quarter-glass of whiskey in my hand), was to just punch the thrusters and attempt to get a full view of the world that I was about to make my own. It didn’t take long for me to literally and figuratively crash-land back on the hard soil that this game, and Planet X, provided to me. The first thing I did was die… A lot. I died when my thrusters ran out of fuel in my very first action in Planet Nomads, and then I continued to do so in a variety of other ways over the course of my multiple hours of playtime. Once, it was by not understanding the mechanic of food gathering. Another time, it was by thinking that I could gather wildlife-guarded resources to make them my own, and then foolishly thinking that I could somehow defeat that wildlife with the puny laser from my multi-tool, which I couldn’t. The tutorial system tries, but it doesn’t succeed. Planet Nomads,on Survival Mode, is hard. It’s not only hard to grasp because of its complexity and learning curve, but also because it’s familiar enough to games like No Man’s Sky or Rust (this game feels like a direct mix of both) that I thought I naturally knew what I was doing, which was wrong — I didn’t. Craneballs has tried to make this game accessible, with an in-game tutorial system that covers the basics through static images with step by step instructions. This is an intuitive way to begin working through game mechanics, but unfortunately, it comes up short once the player has expanded past the most basic of tasks. For instance, although the absolute freedom of an open world game is fantastic, it’s difficult to understand how to use the resources gathered to progress into building or creation of weapons/equipment. I’m not sure if it would be more intuitive for others, but I had a hard time doing much more than running for miles on end or getting killed by animals, mostly because I didn’t know where to start. The landscapes and creatures are almost worth it. Running for so long wasn’t so bad though, because the landscapes are interesting and colorful, but not so foreign that it feels unsettling. The animals in the game are well thought-out and look like creatures that could exist, which adds to the ambience of the exploration — a strong benefit. While exploring, destroying various rocks or weird plants with my multi-tool took longer than I expected to become tiresome, but eventually the action worked its way to the grindy side of things (which is what plagued No Man’s Sky). I always question why games like these feel the need to put a limiter on the multi-tools; what is wrong with just being able to use it indefinitely to gather? The mechanic of having to acquire new ones is frustrating and seems to only elongate elements of gameplay that are tedious to begin with. It makes far more sense to have a weapon/tool deterioration mechanic, and have you solve for that issue, instead. Planet Nomads does not, however, feature a great system for building, and it hurts the game a great deal. One of the primary reasons that people are drawn to sandbox-style games is the ability to impact the world around them and build it into what they think it should be. In recent decades, games like Minecraft have taken this concept mainstream and created a pretty strong minimum expectation for other titles [EN: Check out Factorio, too, while you’re at it: 10/10, with nearly 16,000 reviews on Steam]. One of my favorite parts of playing Rust, for instance, is the gathering of resources and then building, with hopes of making something strong enough to withstand another player’s attack. What I am driving at here is that: if building mechanics are built into a game successfully, they can cover up a lot of other elements of gameplay that may be lacking or inadequate. Planet Nomads does not, however, feature a great system for building, and it hurts the game a great deal. Although there are some cool things to do with the building system, it is complex and feels clunky. Additionally, the blocks have a hard time orienting themselves correctly, so a significant amount of time is spent trying to get your avatar into a position to make the wall or doors place properly. When a base element of gameplay (one that drew me to the title) is so poorly executed, it highlights all of the other issues instead of hiding them, which is the case here. Hopefully, some of these issues are fixed as the game continues to be developed. 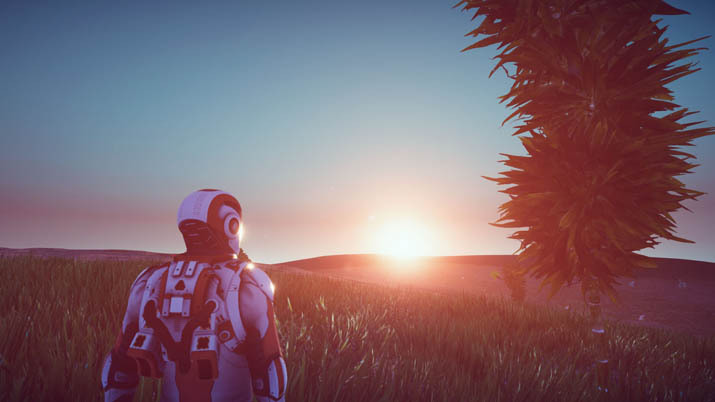 Given that Planet Nomads is in alpha, I’ll give some of the issues a pass, but there are some serious optimization problems with this title, and the building mechanic is borderline terrible. Movement felt delayed, graphics looked choppy more often than not when moving, and the game went through a serious bout of crashing until I switched to a windowed-only view. The reality is that so much of the gameplay here is predicated on movement, so if these issues aren’t resolved, it will be a major detractor. Although I haven’t gotten the chance to engage in every gameplay event (other ships arriving, space travel), these do seem to be interesting elements to explore going forward. Another interesting tidbit about Planet Nomads is that it was developed after getting full funding on Kickstarter, which goes to show that the market for these type of games is strong, even if this one ends up disappointing. There’s a lot of room for improvement for this title, but the foundation the devs have built is workable. If they continue to listen to the community and make changes that enhance their core elements, this game could be great. Keep your eyes on it going forward, but be wary that your expectations might not be met if you jumped into the game now.